Parts: 38 resin - including clear canopy . Instructions: 5 pages with photos, screen shots, and diagrams for assembly and decal placement. 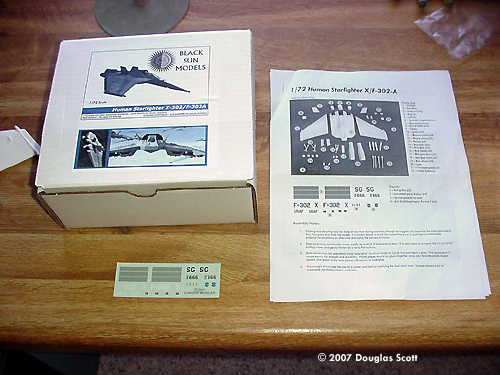 Stargate seems to have slipped through the cracks when it comes to finding models to build from the show, so I couldn't pass up a chance to get a F-302 from the Starship Modeler Store. I’m glad I caught it when I did, because these babies went fast. The box is sturdy with some nice cover art and two screen shots from the show. All pieces where well packed in bubble wrap. Smaller pieces are contained in a small zip-lock bags. The clear canopy had its own bag and the decal sheet was tucked neatly away in the instructions. The main fuselage and two wings are very well done. There is very little flash or extra resin. Panel lines are recessed and straight. The smaller parts do have some extra flash, but a lot less than some other kits I’ve done. Only one obvious mistake could be found. Black Sun Models does address this and even gives several suggestions on how to correct the problem. On the bottom of the fuselage in the back, just before the engine, there is a triangle shape part to the ship. For some reason, there are two rather deep recesses (Black Sun reports that the area caved in during molding, and it wasn't noticed until twoo late. It will be fixed on any future production runs of this kit - Ed.). It should be an easy fix, plus it’s located on the part of the ship no one is going to get a good look at, but us pros will know its there so we’ll fix it anyway. Are the parts accurate? That’s a tough question because there isn’t much in the way of reference for this ship. Screen shots aren’t that helpful anymore because the producers have found that blurry and shaky camera shots make your feel like you really there. But from what I’ve seen on TV, and a few diagrams on the internet, I give it high marks for accuracy. As for detail, there isn’t much to speak of, but that’s not really a problem because the F-302 is based on current Earth tech mixed with alien tech. The ship has as much detail as you would find on any current F-18 and probably more than you would find on a F-22, so the amount of detail is just right for this model. I couldn’t find any pin holes on this model at all. I thought that I had found two, but it turns out that they were the inserts for the tail fins. The resin had filled them in a little. I few turns with a right size drill bit, and your tail fins will drop right in like they should. The holes on the underside for the missile launchers are clean and ready to go. If you don’t want to mount the missiles, then you can fill them in. The back of each wing where it joins the fuselage is missing just a touch of resin. Some filler and a little sanding will fix this up nice and easy. The instructions are easy to read and follow. Tips are given on how to do decals, fixed warped resin (none found in this kit), different types of glue to use and the use of a primer coat before painting. I have to say, I’ve never put together a store bought model with that many tips available. On page one, a detailed picture of the parts and a parts list cover most of the page. 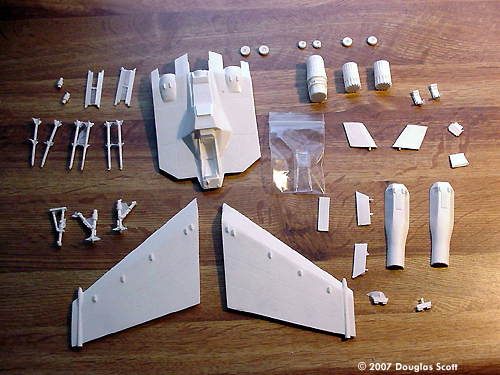 Page 2 includes some assembly instructions with advice on how to install and detail the cockpit. Color pictures of the cockpit are included. Page 3 finished the assembly with more pics and advice on painting. 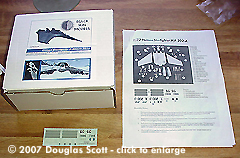 Pages 4 and 5 are dedicated to the decals, of which three variants are available: X-302 as first seen, operational F-302 from later seasons of SG-1, and non-canon F-302A in 'real-world' markings. Nice job! There are slight "ledges" along the joint between the fuselage and wouter wings (see the pictures at left). The joints will require some reshaping in order to get the wings to align properly. As for myself, I don’t feel like playing with it, so I intend to remove the male end of the joint altogether and used pins for added strength. The instructions and I both recommend pins whether you clean off the "ledges" for not. It’s not really a problem with the wings drooping over time. The problem is that if you drop this model a little too hard on the table after assembly, the first thing that will hit is the wing tip because they angle downward. That means it won’t take much to pop that wing off and ruin your ship. I love this part. The instructions provide you with details on how to assemble it with landing gear up or down. Only one problem. There are no pilots in this kit. Lucky for us that the Stargate timeline is the same as our own, so if you have a few detailed pilots from any Air Force kit, you should be able to set them up as F-302 pilots. I plan to put the F-302 in flight mode. I have never liked the look of some planes that seem to have giraffe legs for landing gear. This is necessary because of the wings that angle down. In the show, the F-302 looks like it is dragging it’s wingtips on the ground, so I will build it in flight mode (with some added pilots) and it can keep my B5 starfury company. This is a really nice kit. It is very well put together from the beginning to end. I was hesitant to get it at first because of the price, but I’m glad that I did for many reasons. If Black Sun makes some more of these and you want to learn how to build resin models, this would be a great starter kit due to the lack of problems and ease of assembly. Please click here for a build review. Many thanks to Douglas' wallet for providing the review samples. Manufacturers and retailers, interested in getting your wares reviewed and publicized on a site averaging 3500+ readers a day? Contact us! This page copyright © 2007 Starship Modeler. First posted on 29 November 2007.